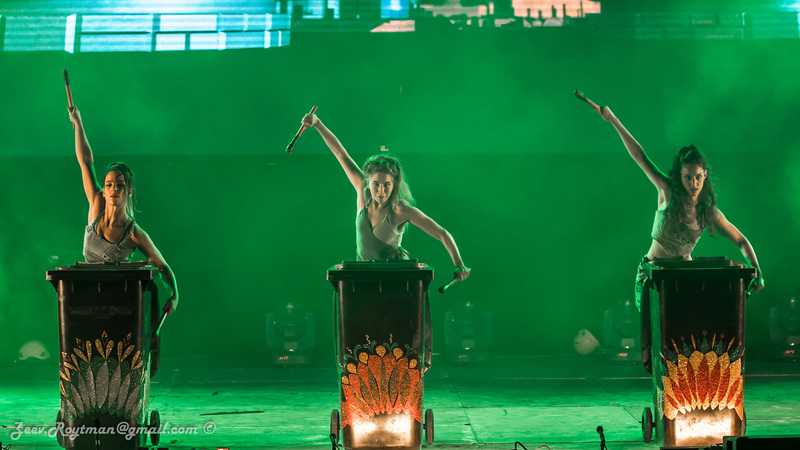 The British-bred percussion sensation “Stomp!” which has been a boffo hit throughout the world since the 1990s, based its show on the notion that you can make a joyful noise with everything from brooms and plastic bags to kitchen sinks. Mayumana, the Israeli dance and percussion troupe based in Tel Aviv’s Jaffa neighborhood, holds on to that show’s basic concept, but it drives things full-force ahead with some great bolts of 21st century electrification and elaborate multimedia sound-and-light flash. And as it demonstrated Wednesday night at the Harris Theater for Music and Dance – where it was the opening night production of Stomping Grounds, the umbrella title for the 30th anniversary celebrations of the Chicago Human Rhythm Project (CHRP) – it can put its gonzo energy and highly syncopated rhythmic virtuosity to work in ways that easily excite and engage its audience. Although billed as something of an homage to Thomas Alva Edison and Nikola Tesla – the two feuding geniuses who waged a “War of Currents” in the 1880s over whose electrical system would power the world – neither of those men’s names are mentioned beyond the brochure for the program. Instead, Mayumana’s inventive ensemble of eight (three men and five notably high-powered women of widely varied backgrounds) displayed their own form electricity. And it ranged from the amplified low-tech of metal boxes and plastic buckets for drums, to a large glass vessel filled with water and a flask for making scooping sounds, to a “dance” done in plastic flippers (complete with the sound of seals), to a corps de ballet-style battle featuring frying pans that brought to life the notion of banging on a can. And then there was the wonderfully funny heartthrob sequence that captured the passionate responses to pair-ups through amplification devices stuck to the chest with Velcro. The troupe’s name, Mayumana, is derived from the Hebrew word for “skill.” And from their exceptional musical synchrony, to their athletic movement and playful way of interacting with the audience, these performers more than live up to their name. In pre-show comments to the audience, Lane Alexander, a co-founder and longtime director of CHRP, not only disclosed that during the next couple of years he will oversee a transition in his company’s leadership. But he noted that Stomping Grounds is dedicated to the memory of Dame Libby Komaiko, the dancer, choreographer and founder of Chicago’s Ensemble Espanol Spanish Dance Theatre who died earlier this year. He also welcomed the presence of Mayor Rahm Emanuel, as well as the consul generals of both Israel and Egypt in Chicago. And there was this news: After a lapse of many years, El Al will reinstate direct flights from O’Hare to Tel Aviv beginning in 2020. • April 3 at 6 p.m. at the Garfield Park Conservatory (featuring Ensemble Espanol Spanish Dance Theater, Mexican Folk Dance Company, CHRP’s Stone Soup Rhythms and Natya Dance Theatre). • April 13 at 7:30p.m. at the Beverly Arts Center (featuring CHRP’s Stone Soup Rhythms, Muntu Dance Theatre of Chicago, Trinity Irish Dance Company and Ensemble Espanol Spanish Dance Theater). • May 11 at 7:30 p.m. at the DuSable Museum of African American History (featuring Muntu Dance Theatre of Chicago, CHRP’s Stone Soup Rhythms, and Mexican Folk Dance Company). • May 18 at 7:30 p.m. at the Irish American Heritage Center (featuring Trinity Irish Dance Company and Trinity Irish Dance Ensemble, Natya Dance Theatre, CHRP’s Stone Soup Rhythms and Muntu Dance Theatre of Chicago). • May 31 at 7:30 p.m. Grand Finale at the Harris Theater for Music and Dance (featuring all of the Chicago companies performing as part of the Stomping Grounds series). Admission to these events is free except to the May 31 Grand Finale for which tickets are $15-$55. For additional information visit chicagotap.org.